Widely acclaimed for its accessibility and engaging approach to the subject, the fourth edition of The Methods and Skills of History combines theory and instruction with hands-on practice, making it a comprehensive guide to historical research and writing. 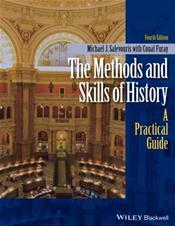 Combines theory with hands-on practice in its introduction to historical methods. Includes a series of field-tested exercises designed to make the research and writing of history more meaningful and accessible to readers. Features expanded coverage of writing history and up-to-date coverage of online research Designed to strengthen students' critical thinking and communication skills.